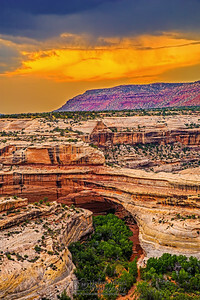 The stunning landscapes of Natural Bridges National Monument, located at the junction of White Canyon and Armstrong Canyon, were formed as a result of erosion on the Colorado Plateau. Natural Bridges was Utah's first National Park Service Area. One of the parks natural bridges, Sipapu Bridge, is the 4th longest natural bridge in the world according to National Park Service Measurements (268 feet). 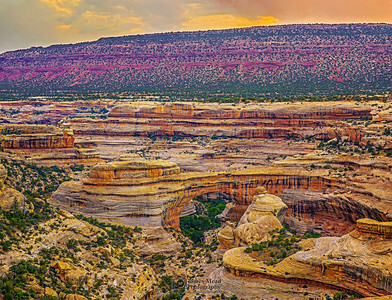 With 3 different Natural Bridges and well preserved ruins, this remote National Monument is a spectacular place. 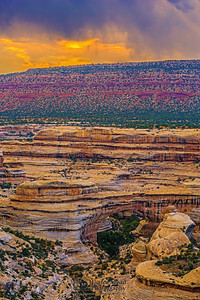 Rains clouds begin to arrive as a Thunderstorm sets at sunsets over Kachina Natural Bridge in Natural Bridges National Monument, Utah. 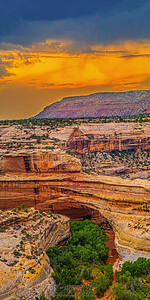 A Thunderstorm brings rains and clouds as the sun sets over Sipapu Natural Bridge in Natural Bridges National Monument in Utah. As the sun sets, an approaching thunderstorm forms a Squall Line over Sipapu Natural Bridge in Natural Bridges National Monument in Utah. 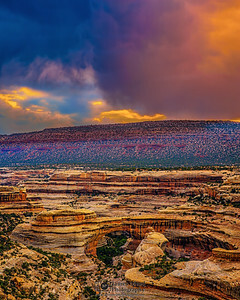 Storm clouds form over Kachina Natural Bridge at Sunset as a thunderstorm moves in over Natural Bridges National Monument.